Otago and Auckland rallying duo Andy Gillies and Nathan Pilcher capped a fine return to the New Zealand Rally Championship with a podium finish in their class at the weekend’s Otago Rally. International rally star Hayden Paddon won the rally outright in his AP4 specification Hyundai by a comfortable margin of more than seven minutes from Ben Hunt in second and Dylan Turner in third. “We had our work cut out with two fairly significant moments where we went off and lost a fair bit of time,” explained Pilcher. “The rest of the day actually went very well for us and with the car running very well despite it being on its first rally in more than nine years we were able to claw back over five minutes of time to get into the top three again. We only missed out on second by 4.7 seconds so we are definitely encouraged with our result knowing we have lots of room to improve and areas to work on ahead of the second round next month. 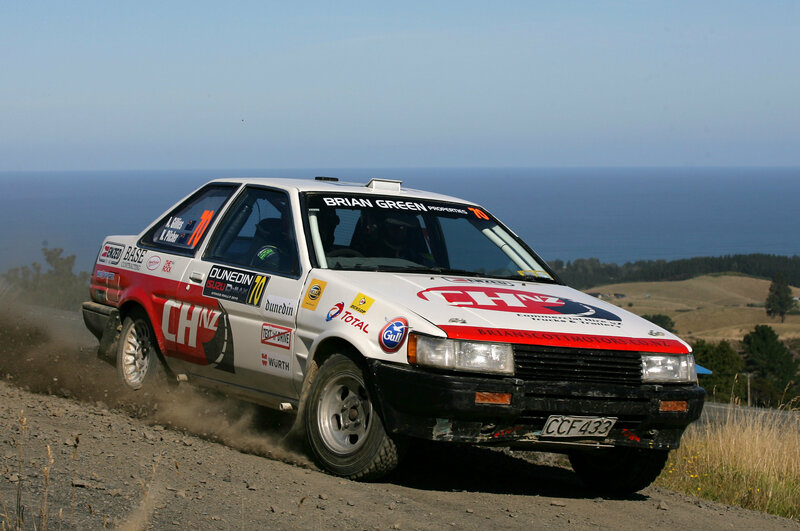 The pair now sit third in the class in the championship points for Category 5B of the New Zealand Rally Championship in their Toyota Levin AE85 – formerly rallied by Paddon’s father – behind early leaders and fellow Toyota runners Wayne Rowberry and Callum Smith in their Starlet and second placed Daph O’Rourke and Brianna Little in their Corolla. The 2019 campaign by Andy and Nathan in the Commercial Hire NZ Toyota Levin is also be supported by ENZED, Total Lubricants, Wurth NZ, Wet&Forget, MG Minerals, Superfinishing NZ, Arrowtown Bakery, Base Contracting, Brian Scott Motors and Prestige Commercial Vehicles. Following their first appearance of the season in Otago. the dup now move on to the Rally of Whangarei in early May, the second round of the 2019 New Zealand Rally Championship.